From an employee’s acceptance of a job through the prehire process and into day 1 at the organization, your company’s onboarding practices set the tone for the success—or failure—to come. Is your onboarding program boosting your safety culture, or is it hindering it? Read on for some safety culture onboarding best practices in a Q&A with Cathy Hansell, president of Breakthrough Results, LLC. For almost 40 years, Hansell has led company safety culture transformations to achieve sustainable EHS excellence and create new business value. She has held various senior leadership positions in EHS, product stewardship, sustainability, and manufacturing quality areas, and was recognized as one of the Top 100 Women in Safety from the American Society of Safety Professionals (ASSP). 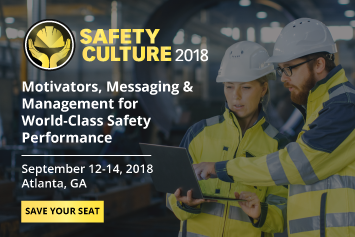 She will be presenting an educational session, “Best Practices for Onboarding: Gain Buy-In, Secure Trust, and Motivate Employees from Day 1,” at Safety Culture 2018, taking place this September 12–14 in Atlanta, Georgia. Q: What are 3 must-have elements of an excellent safety onboarding program? First, an excellent onboarding program must be a partnership of safety with Human Resources (HR), the function that owns the process. 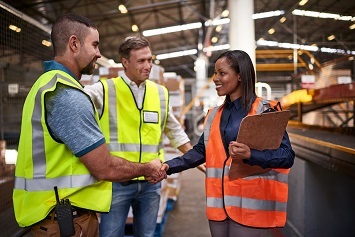 Safety issues and factors can be incorporated into all aspects of the onboarding programs—the content, formats, and timing of all appropriate onboarding activities and materials being distributed to each audience type (i.e., leadership, functional leaders, supervisory staff, and hourly employees). Second, onboarding content should include not only basic policy and procedure information, but also the company vision, value, and culture, making clear the embedded safety value consisting of expectations and accountabilities within the company culture. New hires will then truly understand the company’s commitment to safety and what their role is in it. Third, make it personal! The onboarding program presents the opportunity to create excitement and confidence in the new hire to be a part of a new “family,” to meet the new job challenges, and to build trust and credibility in the organization. The prehire time (after acceptance and before starting on day 1) can be used to complete much of the required paperwork. This opens up the welcoming day 1 to be a positive experience, where the new hire is introduced to team members and his or her supervisor or perhaps the site leader, to tour the workplace, and to be provided clear job scope and initial work materials, tasks, or on-the-job (OTJ) training. Q: What role does trust play in employee engagement with company safety programs? Trust enables and motivates people to take chances, to step out of their comfort zones and to voluntarily get engaged. Trust removes fear of failure, embarrassment, and reprisals. These are necessary conditions for people to voluntary get involved with safety programs and meet their safety requirements like reporting incidents or hazardous conditions. The more people that get involved, the more other people will be curious, interested, and trust the organization that getting engaged is a positive experience. So a fly wheel of engagement is created, building on past successes. Q: What’s the biggest onboarding mistake that a company can make as it relates to safety? How will people be expected to participate. Some required safety information can be provided during prehire period. The remaining required safety information and training for operational tasks can be presented on day 1 in an entertaining, hands-on way with team members and peers. Relationships also begin to be formed on day 1. Good onboarding creates the opportunity for the new hire to feel like part of a team and welcomed to ask questions and seek help. Q: Why is safety culture particularly important in today’s EHS landscape? A safety culture shapes and directly impacts the safety strategic vision, aligned with the company culture, as to what are considered acceptable and expected safety actions, behaviors, and results. Today, the role of safety is expanding from compliance to risk prevention, and onto security, wellness, and total worker health. Further expansion into sustainability is opening up more safety-related roles in supply chain resilience and responsibility, community outreach, good health and well-being for families and communities, and new value-added products and services. 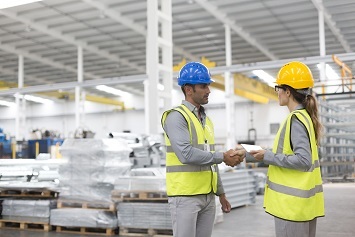 The role and impact of a safety culture is most easily described as an enabler of safety (or EHS or sustainability) excellence, performance, and business results. Business cost savings and accelerated results and value. A safety culture is not independent of the organizational culture. It is embedded within the organization. It is the value that the organization places on safety and how safety is embedded in every business process and decision. It is usually termed ”safety culture,” but it is not an independent or parallel culture state. The business “owns” it. Safety professionals have roles as enablers, teachers, partners and technical experts. Although it is true that organizational culture impacts the implementation of business strategy, culture is also a part of an overall strategy. The most effective safety strategies that I have developed and implemented have three components: Culture, processes, and talent. Culture, we’ve talked about—safety embedded as a value into the organization, creating an embedded safety culture. Processes are those safety management systems and preventative programs. Talent is the EHS professionals, staff, and volunteers. All three elements are needed to achieve excellent performance and the many value-add opportunities that good safety can provide. This thinking is no different than a businesswide culture. A culture needs its own strategy for planning and execution, including processes and people to design, educate, implement, engage, and continually improve it. Data mining with leading indicators. Q: Are you generally optimistic or pessimistic when it comes to the state of safety culture at organizations today? I’m definitely optimistic about safety culture and its continuing role in business. It has been proven that safety culture is an enabler to global business success, reductions in injuries, and associated reductions in costs and absenteeism rates. Value-add expands to improvements in productivity, quality, and efficiency, and new safety-related products and services. Employee morale and retention rise, leading to improvements in everything I just mentioned. It is a powerful cycle. On a broader scale, safety is a core component of sustainability. Safety culture encompasses about 60% of the requirements within sustainability, and up to 70% when considering an added element of environment, when compared to the sustainability requirements within GRI 4.0 and ISO 26,000. Leadership actions, risk identification and prevention processes through a life cycle, management systems, employee engagement, stakeholder and community outreach, accountabilities, leading indicators/KPIs, new business value and benefits, ethics, assurance, governance are all elements included in a strong safety/EHS culture and as required actions within sustainability frameworks. These expectations and actions also underlie such global initiatives and commitments as COP 21 and the 17 UN SDG. So, strong safety and/or EHS cultures position companies well to meet the challenges of today and tomorrow. Join Cathy Hansell for her educational session, “Best Practices for Onboarding: Gain Buy-In, Secure Trust, and Motivate Employees from Day 1,” at Safety Culture 2018, taking place September 12–14 in Atlanta, Georgia!